At some point in our lives, most of us will be affected by lower right back pain. Aches and pains in the right side of your lower back affect women and men, young and old. Low back pain usually just affects one side of your body and the pain can range from a mild constant ache to sharp, shooting pains that have a debilitating effect. Your lower back is called the lumbar region, and therefore low back pain is often referred to as lumbago. There are many reasons for experiencing aching pains in your back just above your hips. For example, injury to the muscles and ligaments through wear and tear, inflammation in internal organs, or even digestive problems can cause low right back pain or low left back pain. Depending on the cause of soreness in your lower right back, you may experience other symptoms along with varying degrees of pain. For example, pinched nerves in your lower back will also cause tingling and possibly shooting pains going down one leg. Or, kidney stones can feel sore in the lower back, the groin and abdomen when they move. Many women also experience lower right back pain more than men because of their menstrual cycle. In this article, you will learn about what causes lower right back pain and how to treat the symptoms naturally. This information will help you get rid of aches and pain in the area of your back below your ribs and above your pelvic bone. Mild to severe pain along with muscle stiffness are the most common symptoms of low back pain on the right side or the left side. However, the causes of low back pain are many and varied and you may experience other symptoms. One common symptom associated with lower right back pain is trouble moving. For example, Dr. Arefa Cassoobhoy on WebMD says that pinched nerves in your lumbar region can cause soreness if you stand in one place for a long time, getting up off a chair, or bending over.1 The pain may be very intense and radiate from your lower right back down your right leg. Trapped nerves in your lower back can also cause pain that radiates to your groin, abdominal area, or up your spinal column to your thoracic region in your upper back. Because of problems with their menstrual cycle, women experience lower right back pain more frequently than men. For example, ovarian cysts, uterine fibroids, or endometriosis can all be a source of back pain on either side of the back as well as spotting before or after your period, and abdominal cramping before your period. Many women who are pregnant experience lumbago across their lower back during pregnancy. The most common reason for lower right back pain is due to muscular, nerve, or other conditions related to the spine and pelvic bone. Old age, wear and tear, or trauma to your lower right back are common sources of lower right back pain. Your lower back is under daily strain from performing tasks, walking, or taking part in strenuous activity. Over time, this can cause small fractures in the vertebrae in the back or cause micro tears in back muscles. You may also develop a pars defect: a crack or fracture in a small connecting bone in your lower spine. At the end of this article, you can learn how to use heat to treat most symptoms of lower right back pain. Pulling or straining a muscle in the right side of your lower back will cause pain in that area that may also cause pain down your right leg. If the muscle strain results in a tear, you may end up with excruciating pain in your lower right back that takes a long time to heal. Chronic or acute muscle strain in the lower right back will often cause discomfort while going about your daily activities. Very often, heat treatment, improving posture, or massaging the lower back can help to relieve any low back muscle tension and pain. Sciatica is a common problem and it usually affects just one side of your body. Your sciatic nerves run from your either side of your lower back down each leg. If the right sciatic nerve becomes pinched, trapped, or damaged, you will have low back pain, tingling down your right leg, and maybe even pain in your upper thigh. Doctors from the Mayo Clinic say that sciatica pain can cause mild to sharp pain in one side of your lower back. The pain can sometimes feel like an electric shock and can cause a sore burning sensation in your buttocks, backs of your legs, and even feet. Coughing or sneezing can send shooting pains from your lower right back down your right leg. You can help get rid of severe lower right back pain caused by sciatica by doing gentle exercises to help release tension and nerve irritation. For example, a simple tennis ball can help get rid of pain caused by the sciatic nerve or you can try exercises using a foam roller or yoga stretches for sciatic pain. Heat packs are also an effective way to treat sciatica pain. A herniated disc will cause agonizing pain in your lower right back or lower left back depending on which disc is affected. Small jelly-like discs are found between your vertebrae in your spine and they help to cushion your upper body and support your spine. Wear and tear or injury can cause a disc to herniate which will cause sudden back pain. Dr. Shiel recommends using heat and cold treatments to relieve the initial pain and to avoid any activity which aggravates the low back pain. Also, simple exercises to strengthen the lower back can help prevent further occurrences of a herniated disc. You should also lift heavy items correctly to prevent injuring nerves, muscles, and vertebrae in your lumbar region. Not standing or sitting correctly can put undue pressure on your lower spine and cause right-sided back pain or agonizing aches on your right lower back. Poor posture creates an imbalance in the muscles in your back causing them to shorten and tighten up. Habits to avoid to prevent poor posture causing chronic back pain on the right side are not slouching over your desk, standing straight with your shoulders back, and making sure your seat has good support for your lumbar region. One way to improve your posture is to strengthen your core muscles by using plank exercises. There are many helpful exercises to improve posture which will also help to prevent shoulder blade pain and neck pain and help you avoid the symptoms of strained upper back muscles. Pain in your lower right back could be caused by arthritis that is causing inflammation in your sacroiliac joints or pelvic bone. Physical therapy can help relieve the chronic pain that arthritis causes in the lower back. This can also help reduce low back pain while you are sleeping and help you get a better night’s sleep. Problems at the base of your spine where the sacrum joins the hip bone is a common and, often, misdiagnosed cause of low back pain. The sacroiliac (SI) joint is located between your hip bone and spine and any inflammation or excessive movement in the joint will result in lumbago (low back pain). At the end of the article, you will find excellent methods to treat SI joint pain and help relieve lower back pain. Osteoporosis causes bones to become brittle and weaken which can cause low back pain on one side or both sides of your back at the same time. Certain medical conditions like a vitamin D deficiency, smoking, hormone imbalances, or certain medications can weaken bone structure causing small fractures. You can help prevent osteoporosis naturally by exercising and consuming foods that are rich in calcium. Also, making sure you have enough vitamin D will also help keep your bones healthy and prevent inflammatory conditions. A constant dull ache in your right lower back or sharp, agonizing back pain could also come from inflammation or disease in an internal organ below your ribs. The lower right side of your back includes the right kidney, which is located towards your back, just below the rib cage. Part of your stomach, intestines, and colon are also located on the right side of your abdomen and, usually, if you have any digestive problems, the digestive-related pain may also be felt on the lower right side of your back. Women also have part of their reproductive system on the right side of their body. For example, ovarian cyst on the right ovary can also be a source of pain in women in the lower part of their back. A kidney infection or inflammation can cause pain in your middle back that radiates to your lumbar region. Your kidneys are located behind your ribs in your back and they can become sore if bacteria cause an infection. If you have low back or flank pain, a burning sensation when you pee and your urine is foul smelling and cloudy, then you should visit your doctor to get a checkup for a kidney infection. One way to keep your kidneys healthy is to drink plenty of water. Fluids will not only help prevent the effects of dehydration but they will help detox your kidneys and flush out waste material. You should also limit alcohol intake, go easy on salt and sugar, and don’t consume too much caffeine as these are habits that can damage your kidneys. Kidney stones are another reason for lower right back pain that can range from a dull ache to sudden sharp pain in your back and groin. Kidney stones are small mineral deposits that can build up in your kidneys. The pain can start off as an ache below your ribs and then cause pain in your lower abdomen and groin. 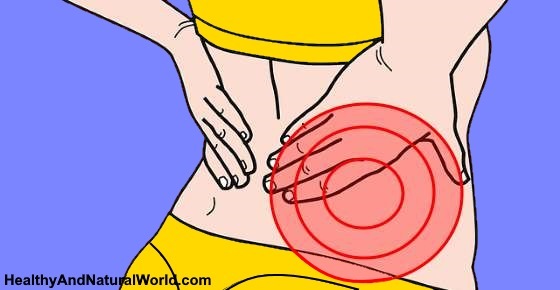 This can cause lower back pains that come and go or be constant and unrelenting. A natural remedy for kidney stones is apple cider vinegar. The acidic content of diluted apple cider vinegar helps to dissolve mineral buildups in your kidneys and get rid of kidney stone pain. Your appendix is located on the right side of your abdomen and if it becomes inflamed it can cause pain on the right side of your lower back. The typical symptoms of appendicitis are a sharp pain that starts off behind your belly button before causing intense pain on the right side of your abdomen. Along with the abdominal pain, you may have a temperature, gastrointestinal issues, and abdominal swelling. Appendicitis can quickly become a medical emergency, so if you have any signs of appendicitis, you should seek medical help immediately. You should treat the first signs of a UTI as quickly as possible. One way to help reduce the symptoms of a UTI is by drinking baking soda water. Baking soda helps to neutralize the acid in urine and soothes irritation in your urinary system. For other treatments please refer to my article on how to treat urinary tract infection (UTI) naturally. Low back pain on the right-hand side or left-hand side can also be caused by some gastrointestinal problems. One cause of lower back pain on the right side is an inflammatory condition of the colon called ulcerative colitis. Doctors don’t know the causes of ulcerative colitis; however, sufferers will develop inflammation in various parts of their large intestine. Some ways to manage the symptoms of IBS naturally include taking peppermint capsules to reduce irritation in your intestines, getting rid of stress as much as you can, and following the low FODMAP diet to help boost intestinal health. Diverticulitis happens when small pockets in the digestive tract become infected and cause pain. This gastrointestinal infection can also cause low back pain in some cases. Some of the best home remedies for diverticulitis include enjoying a high fiber diet, drinking warm water, and taking probiotic supplements to improve your digestive health. Problems with the reproductive organs mean that there are types of right lower back pain that only affect women. Here are some of the most common cause of low back pain in women. Light bleeding before your menstrual period, suffering from groin pain, and having irregular monthly cycles are just some of the other symptoms of ovarian cysts. During pregnancy, you may also suffer from increased pelvic pain, abdominal pain and cramping, and more stress. To ease the discomfort of low back pain during pregnancy, Dr. Pagano suggests using a heat pack on your back just above your hips. One sign of endometriosis is a pain in right side of your lower back or left side. Endometriosis happens when endometrial tissue grows outside the womb on the pelvic tissue. This causes abdominal pelvic cramping, irregular vaginal bleeding, and pain during bowel movements. If you have increased cramping during your period because of endometriosis, a heating pad can help to relieve the discomfort. People who suffer from fibromyalgia experience chronic muscle pain and fatigue. Fibromyalgia can cause sharp pains in the lower back that only last a short time or the pain can be dull and constant that causes daily distress. If you suffer from fibromyalgia, you can help ease low back pain with essential oils. Making your own muscle rub with essential oils can help to release muscle tension and calm the mind at the same time. For more information, please read my article on how to treat fibromyalgia with this natural substance. Shingles is caused by the varicella-zoster virus and it can cause severe pain on the right side of your back or the left side. You can treat lower right back pain caused by shingles using Manuka and clover honey, or try these essential oils. Heat helps to treat lower right back pain by releasing muscle tension and increasing blood circulation to the affected area. Take a clean sock and fill it with rice until it is about 3 inches from the top. Tie the sock to prevent rice spilling. Microwave the sock on full power for 2 minutes and carefully remove from the microwave. Wrap the heating pad in a warm moist towel and hold to the right side of your lower back to boost blood flow. Keep the heating pad on your back for 20 minutes. (You can reheat it in the microwave for up to a minute if necessary). Apply the heat treatment 3-4 times a day to ease lower right back pain quickly and effectively. For more information on when to use cold or heat for lower back muscle strain and injury, please read my article on using cold and heat therapy for muscle pain and stiff joints. It can be a challenge to pinpoint the exact cause of aching low back pain that just affects your right side. Usually, with the help of home remedies, you can ease the pain and reduce the impact that back pain has on your daily activities. Low back pain is accompanied with a fever. The back pain was caused by a severe trauma and home remedies don’t help to relieve the pain. You have numbness and tingling in your right leg or left leg. A herniated disc or injury to your spine result in loss of bladder and bowel control. The low back pain on your right side is severe and unrelenting and affects your daily activities. You have chronic low back pain that lasts for longer than 6 weeks. SportsInjuryClinic. Back pain & posture. NHS. Kidney infection – symptoms. WebMD. Understanding appendicitis – symptoms. WebMD. Ulcerative colitis – home treatment. Eur Spine J.2014 May;23 Suppl 2:214-7.